Having a mobile office in your pocket is what smartphones should be able to deliver without a hitch and that’s exactly what you get with Apple’s own office suite iWork, which is now ported to fit your iPhone or iPod touch. 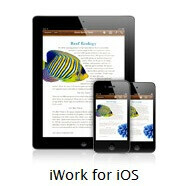 The iOS version of Apple’s iWork was optimized to work with the iPad bringing multitouch, but now it has been further squeezed to fit well on the smaller screen of a handset/iPod. The productivity apps include Keynote for tweaking your presentations, Pages for word processing and Numbers to help you manage spreadsheets, each of them coming with a juicy price tag of $10. Existing iWork for iPad customers, however, can download the apps for free – a clever move by Apple luring you even more into Cupertino’s iOS ecosystem. - Keynote allows you to create multimedia presentations, which you can spice up by adding transitions and fancy animated charts. Playing the presentation on the 3.5-inch screen of the iPhone is not the most practical thing to do, so you can output it to a larger screen device. - Pages is tuned to work well with the small screen of a handset through the Smart Zoom feature which magnifies text in just the right way when editing and shrinks it back when viewing. - Numbers is the spreadsheet app in the iWork suite. It also comes with Smart Zoom, but in addition you can use multi-touch gestures as well as type in functions. Your existing office documents should also be easy to view as the applications support formats compatible with iWork for Mac and Microsoft Office documents. Sharing is also possible without quitting the app. All of the apps are currently available on the first and second generation of the iPad, the iPhone 3GS, iPhone 4 as well as 3rd and 4th-gen iPod touch. While they sound like an essential productivity tool for the large screen of the iPad, the limited space on the iPhone renders them slightly less useful. Check out the download links below and feel free to share your experience with the iWork suite in the comments below.